Oh, to be young. The recent Dolce & Gabbana “New Vision” party celebrated some of the biggest millennial superstars of this upcoming generation. Even though we think Zendaya may have been the biggest star of the evening, the other young style ambassadors and their cute shoe picks were definitely not to be missed. 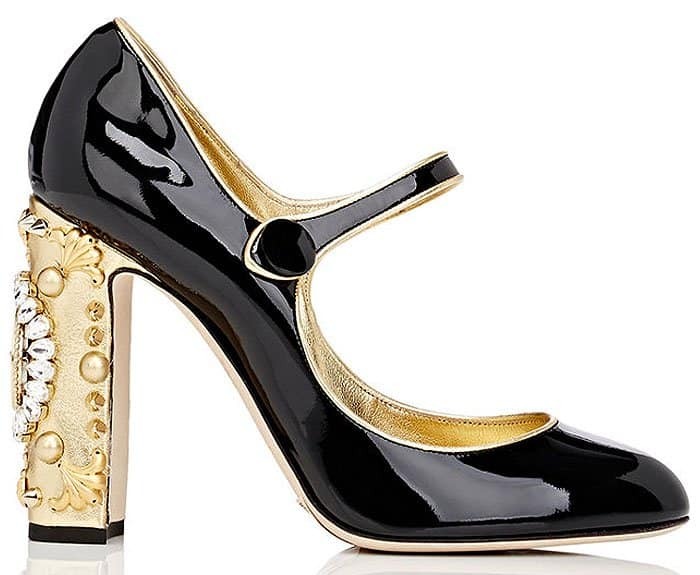 Sailor collars on toes, fur mohawks on the backs of chunky heels, and climbing roses on stilettos were just some of the quirky footwear picks we noticed. Take a peek at the list. 1. Pixie Lott in nautical slingback pumps with anchors on the heels. British singer Pixie Lott went completely nautical-themed for the party, picking a pair of slingback platform pumps to match her navy sailor-collar crop top and sailor shorts combo. Pixie Lott attending a Dolce & Gabbana party on Rodeo Drive in Beverly Hills, California, on March 23, 2017. 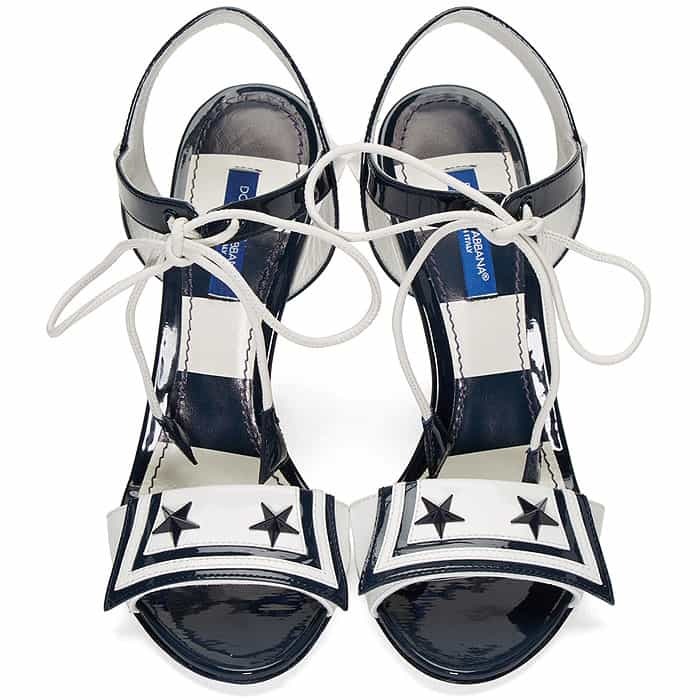 Dolce & Gabbana nautical slingback pumps with anchors and stars on the heels on Pixie Lott. 2. Jhene Aiko in black satin sandals with crystal-encrusted metal filigree on the heel cups. Up-and-coming hip-hop artist Jhene Aiko donned one of Dolce & Gabbana’s ornately printed dresses and paired it with black satin ankle-strap sandals that featured gorgeous crystal-encrusted metal filigree heel details. Jhene Aiko attending a Dolce & Gabbana party on Rodeo Drive in Beverly Hills, California, on March 23, 2017. Dolce & Gabbana satin sandals with crystal-encrusted filigree-back heels on Jhene Aiko. 3. Lisa Rinna in glittery gold t-strap pumps with pink fur pom and blue fur mohawk details. Lisa Rinna picked one of the most elaborate pairs of shoes we saw at the event. 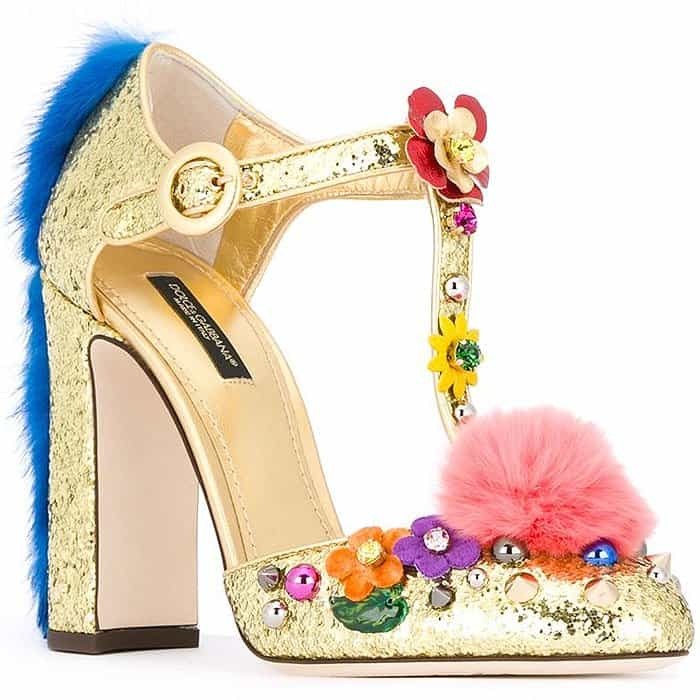 Her footwear featured gold glitter, flower appliques, pink fur poms on the toes and blue fur mohawk details down the back of the heels. The TV host wore them with an equally heavily embellished dress, but we think she was able to pull the look off. Lisa Rinna attending a Dolce & Gabbana party on Rodeo Drive in Beverly Hills, California, on March 23, 2017. Dolce & Gabbana fur-and-flower-trimmed glitter t-strap pumps on Lisa Rinna. 4. Delilah Hamlin in PVC-and-patent mary janes studded with flowers and spikes. Lisa Rinna’s daughter Delilah Hamlin also delighted in heavily embellished Dolce & Gabbana mary janes. The budding 18-year-old model’s chunky heels featured trendy clear PVC paneling studded with flowers and gold spikes. Delilah Hamlin attending a Dolce & Gabbana party on Rodeo Drive in Beverly Hills, California, on March 23, 2017. Dolce & Gabbana flower-and-metal-embellished PVC-and-patent mary-jane pumps on Delilah Hamlin. 5. Olivia Jade Giannulli in “Keira” satin sandals with pink rose vines on the heels. Lori Loughlin’s daughter Olivia Jade Giannulli was blooming in the Dolce & Gabbana “Keira” strappy sandals that featured rose vines climbing up the stiletto heels. Olivia Jade Giannulli attending a Dolce & Gabbana party on Rodeo Drive in Beverly Hills, California, on March 23, 2017. Dolce & Gabbana “Keira” pink-rose-heel strappy satin sandals on Olivia Jade Giannulli. 6. Karsen Liotta in “Keira” strappy sandals with red rose vines climbing up the stilettos. It seems the “Keira” sandals were very popular that night! Karsen Liotta — Ray Liotta’s daughter — also picked them to wear to the party. Karsen Liotta attending a Dolce & Gabbana party on Rodeo Drive in Beverly Hills, California, on March 23, 2017. 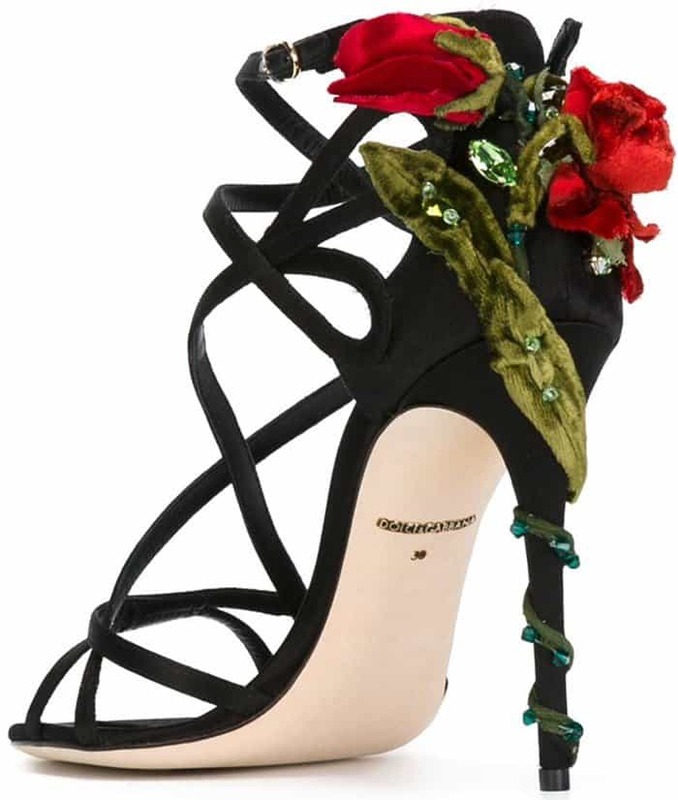 Dolce & Gabbana “Keira” red-rose-heel strappy satin sandals on Karsen Liotta. 7. Ana de la Reguera in “Cady” polka-dotted sandals with chunky pyramid heels. Finally, Mexican actress Ana de la Reguera went full Frida Kahlo on us in a blue floral headpiece, flower earrings and polka-dotted “Cady” sandals with pyramid straw heels. Ana de la Reguera attending a Dolce & Gabbana party on Rodeo Drive in Beverly Hills, California, on March 23, 2017. Dolce & Gabbana “Cady” polka-dotted straw sandals with pyramid heels on Ana de la Reguera.